Design by Margaret Casson. 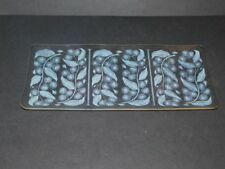 Set of 2 1950s Chance Glass Plates in the Swirl pattern designed by Margaret Casson. Happy to make you a cuppa while you have a look and make sure it's what you want. Glass with lovely floral print. Chance Handkerchief Vase Bowl Vintage textured Cobalt Blue retro 10cm x 15cm. Dispatched with Royal Mail 2nd Class. Lovely, no damage. E Glass Red Striped Handkerchief Vase. 1960s 70s Chanc. Carries its original Chance Glass sticker. Weighs 0.7 Kilos. Chance glass Gingham bowl by Pilkington. in excellent condition with it's original paper label. 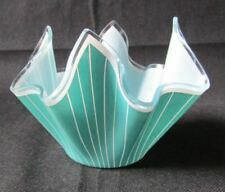 Turquoise Green/Blue with white stripes, handkerchief vase produced by Chance Glass, England in the 1960s from the 'Cordon' range. 1960s Retro TurquoiseGreen/Blue & White Stripes Handkerchief Glass Vase. Lovely shape to this dish. In Excellent condition. An original box is included but not in great condition. A selection of 4 rectangle sandwich plates in a variety of patterns by Chance Glass, England. The patterns are Happy to make you a cuppa while you have a look and make sure it's what you want. SOLD AS SEEN. FAST DISPATCH. This glass bowl has a white curving leaf motif and gilded rim. The bowl is. Selection of four 1970s Chance Glass Plates in floral designs Happy to make you a cuppa while you have a look and make sure it's what you want. Has its original gold label. COLLECTION OF 3 PIECES OF ICONIC VINTAGE CHANCE GLASS CALYPTO PATTERN TABLEWARE. The collection consists of a large Bowl with a rim dia. of 25cms and a height of 6.4cms. Would make a great Salad Bowl. The condition is good with only the lightest signs of use on all the pieces with the exception of gold gilding on the Bowls being worn. All six bowls have the pressed glass design by Chance Glass in the Britannia pattern. 1949 CHANCE BROTHERS "BRITANNIA " PATTERN GLASS DISHES. Great colour. Excellent condition. Measures approx 5” in width and height. Boxed Chance Glass plate in new condition. In fantastic condition, well looked after, beautiful Red & White design. 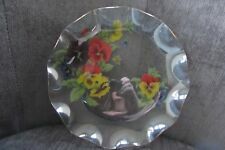 Vintage Chance Glass Bon Bon Dish Fluted Plate Summer Flowers 20.5 cm/8"
With a gold rim. I will do everything in my power to make sure you have a pleasant experience. this can be seen in the photos. A FAB 70'S CHANCE GLASS, 4" HANDKERCHIEF VASE, CARRE / ESCHER PATTERN IN BLUE. Made from a square sheet of slumped glass, these Venetian ‘fazzoletto’ inspired vases are a fantastic retro talking point - especially in this fabulous pattern/colourway. Gold gilt edges. White Swirl design. Apx 21 x 14 x 2cm (very shallow bowl). There are marks around the underside of the fluted edge of the large plate. These lovely, part frosted, clear pressed glass bowls are a good size, practical item and they have lost none of their looks or flair since they were made. Robert Goodden was a fantastic designer and these are part of the Waverley Pattern Collection, dated from circa 1949. "Chance" Glass oblong plate Coloured Fiestaware c1951. Approx 34cm long, 16cm wide. Condition Has a nibble to the rim, shown in final picture. Murano Glass. British Glass. Czech Glass. FLUTED GOLD RIM. SWIRL EFFECT WHITE LINES. Drinking Set in the 1950s Chance Glass Swirl pattern designed by Margaret Casson,includes the 'Giraffe Carafe' and 5 bucket shaped wine glasses, 3 large & 2 small. Design by Margaret Casson. Happy to make you a cuppa while you have a look and make sure it's what you want. 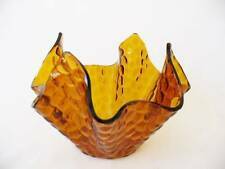 ICONIC 1950'S CHANCE GLASS ROUND WAVY EDGE PLATE. 21cm ACROSS. Believed to be produced circa 1955, and regarded as being amongst the first Chance handkerchief vases made (along with blue-flashed & swirl patterned versions) these early examples have a level rim rather than the pointed folds of all the later variants. 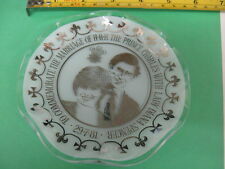 A smart little slump glass dishwhich was produced by Chance Brothers Ltd in the 1970’s. The design is the Royal Naval College Greenwich in gold on a black background. This is in fabulous condition considering its age & how fragile it is. 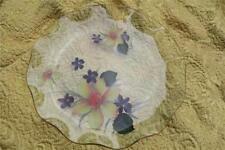 Beautiful retro glass plate made in 1960s/70s. There is a small air bubble towards the centre of the plate, as pictured. The 8" (20.5cm) wide plate is fluted (curvy edges) with gold gilt edging. The floral design is four flower stems in black and grey (almost white) with leaves, on clear glass. 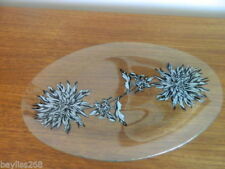 A lovely Monotone floral design by Chance Glass, dating from around 1967. The floral design is Japanese looking cherry blossoms with leaves in pinks and greens on a white background, on clear glass. The 8" wide plate is fluted (curvy edges) with no gold edging. 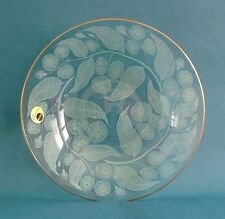 A lovely Oriental floral design by Chance Glass, dating from around 1981. Gold gilt on the handle and the edge of the plate in very good condition. 2.5cm high ( 13.5cm including handle) and 24cm wide. This is a beautiful and scarce Chance glass plate in the iconic Swirl pattern which was in production mid 1950s to mid 1960s, this is the scarce ruby and gold colourway. Large round Chance Glass ruby & gold plate/ dish. Chance Glass Fiestaware Platter with the 1975 pattern “Blossom”. It, like so many of these pieces, does show signs of ware especially to the rim gilding.